From Darwin to Kupang in Indonesia is only 460 miles and most of that is heading westward rather than directly northward where the distance from Oz to Indonesia is less than 150 miles, but in terms of the economic and cultural differences between the countries it should be an immense distance. It is easy to see why the Australian government spends so much time and effort trying to stop ‘boat people’ from sneaking into the country from Indonesia. A few words about the start of the rally and the passage. Technically, the rally was to begin at 11 am with all of the boats crossing a starting gun after a starting sequence just like a race. In actual fact, boats started leaving just after dawn to take advantage of an excellent, favourable wind. Wwe were anchored pretty much on the starting line after leaving the marina the previous day and had the anchor up just before 9 am and could not resist the lure of the wind, so started heading towards Kupang. It would be hard to imagine an easier, more pleasant passage. The first day the winds moved around a bit and quit for a couple of hours (we motored for 1 ½ hr) before settling in just about perfectly behind us, where they stayed for the next three days. We ended up wing and wing (main on one side and genoa straight course in these conditions. The passage took us 3 days and 3 hours and we arrived at Kupang with a group of boats that were in the 47 to 52 foot range which was nice. Next was our introduction to Indonesia bureaucracy – which is legendary. Three officials, all extremely pleasant and very young came on board to start the process. Then we went ashore to a room that had been set up for the rally to finish the entry process. There were twenty (20!) more pleasant young people there that you worked your way through as you went from department to department – customs, immigration, quarantine, health, and port authority. All of them were busily filling in forms and stamping and stapling. We handed in many copies of our passport with the visas and the boat registration, and the CAIT (cruising permit) – and we got to use our boat stamp, which he purchased in Toronto and had only used once, in Ecuador. Here it go a workout as we filled in forms, signed them, and stamped them. Most boats did not have a stamp and went out to get one made in Kupang for $5 with the stamp pad and ink each costing 60 cents. One boat had both a stamp and an embosser like a lawyer would have. The officials were most impressed with this and all wanted to feel the raised stamp on the paper. 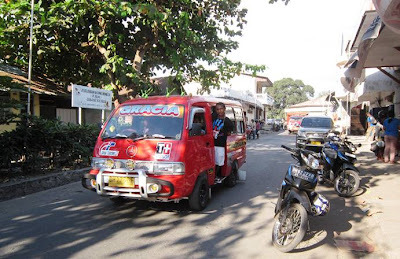 Our introduction to Indonesia proved two things: things here are much, much cheaper than in Oz (not surprisingly) and the people here are remarkably friendly and accommodating, although efficiency is not a word found in the language. An aside, during our briefing in Darwin, the Indonesian man behind the rally commented that in Mexico there is the concept of manana, which in Jamaica would be expressed as “soon come”. He said in Indonesian there is no such word to express such a level of urgency. He said that many people wear wristwatches, but these are for decorative, not functional reasons. We also began our lives as celebrities here. There was a dinner sponsored by the governor with folk dances and Indonesian interpretations of Western music (some quite good). Two nights later there was a dinner put on by the mayor of Kupang, again with entertainment. A few hours before that we were on a tour and stopped at a festival put on the district mayor and there was more dancing and a ‘snack’, the tbag, meet the local officials, and get your picture taken with them. I have no idea what they do with all the pictures. One of the many dance groups we have seen. They are most often remarkably elegant-looking dancers. The tour we did was most interesting, thought-provoking, inspirational, and a bit sad – all at the same time. It was led by a young man named Alfredo who is part of a unique and special family. About 20 years ago his parents who are farmers started to take in orphans. Over time, a few became many and the family now support 92 children ranging from infants to university age, and with no official status as a charity or as an orphanage. The rally indirectly supports the orphanage by providing for an optional $25 fee that goes to a scholarship so the best kids can go to university (so far about 10 have gone to university or are going). Many cruisers also chip in more money when they get a chance to visit the children who seem very happy and well looked-after. The parents have two hectares (4.4 acres) of first-rate rice paddies that have enough water to allow two crops a year – this provides the bulk of the food. Alfredo works during the week and looks after the orphanage from Friday to Sunday so the parents get a break. He also teaches the kids English (he is self-taught and quite skilled) in the evening and gives academic help as well. Apparently he is quite good at this since one of the girls who graduated from high school this year had the highest exam results of any student in Timor – which has a couple hundred thousand people. She is going to university sponsored by Sail Indonesia and wants to be a math teacher. Alfredo’s sister works as a nurse and donates most of her salary to the kids. An uncle and aunt also help out (he is also a minister and leads services for the children). The older children also look after the younger ones. A remarkable story that makes you want to question how you have spent your life. 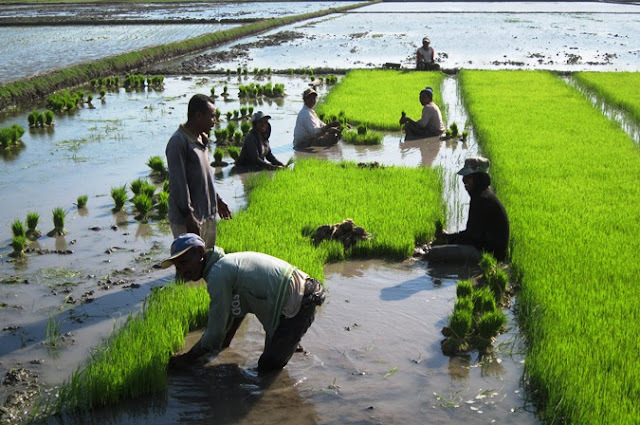 Rice being transplanted. There are very few such areas in the eastern part of the area we visited. The family who run the orphanage own 2 hectares (4.4 acres) of this land. It provides most of the food to support almost one hundred people. Two of the orphans who have lived in the orphanage since around age 7. They are going to university in a few months and both want to be math teachers. The water in the background comes from a spring and is a critical part of the rich rice paddies in this area. During the tour we visited the children and saw where they live. Remarkably, 42 boys sleep in one room that was not all that big. Up to 4 kids sleep in one, largish bunk. The 50 girls sleep in slightly more space. They also grow food around the orphanage. We visited Alfredo’s home and met his parents and toured the rice paddies and saw the spring where the water comes from. If anyone reading this has some spare change and would like to help some delightful children and an admirable family, post a comment and we will get in touch. I have contact info for Alfredo and we can figure out how to get the money to him. 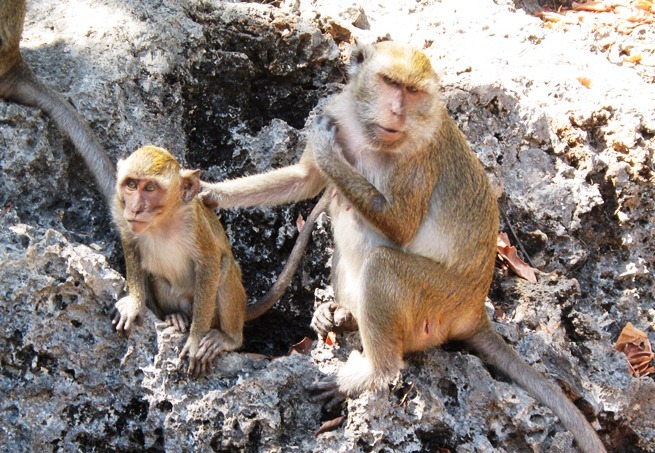 A visit to a monkey sanctuary in Kupang. This was taken at a forge next to the road in Alor where they make knives and machetes. This guy's job is to power the bellows which he is doing with his right hand. It does not require any attention so he can use his other hand and eyes to keep in touch with friends with text messages. 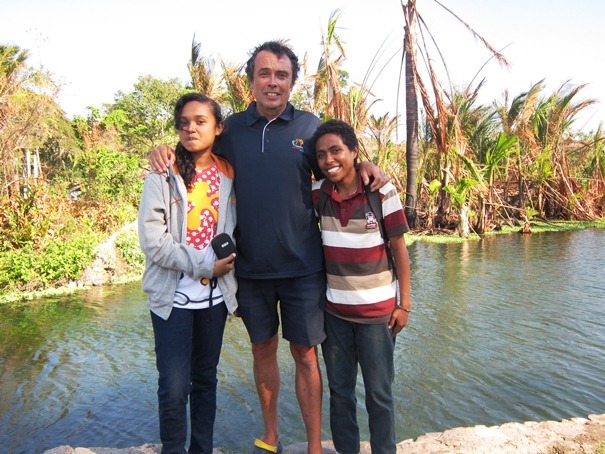 After a few days in Kupang it was time to move on and we were ready for a change as it is a pretty hectic, dirty place. 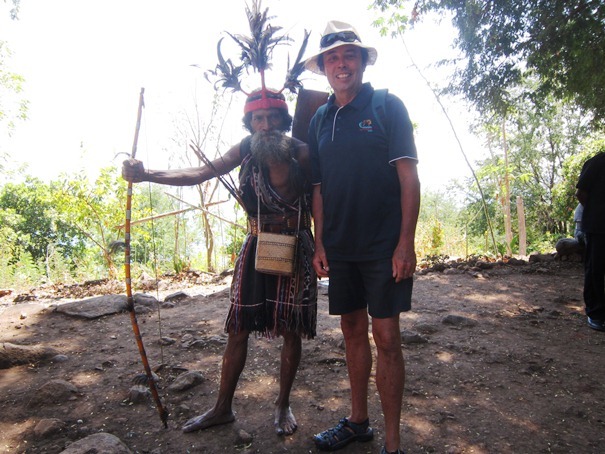 The next scheduled Sail Indonesia stop was in Kalahabi, Alor which is about 135 miles NE of Kupang. Less than half of the boats in Kupang actually came here as it was going east and everyone has spent so much time getting west that it seemed (and was) like going the wrong way. Also it was our introduction to the strong currents that exist between islands in Indonesia. When we left Kupang our original plan was to make this a two day trip with an anchorage somewhere on the north coast of Timor. Anchoring here is complicated by the fact that the water gets very deep quite close to shore and you are very near the border with East Timor which is not one of the happiest border regions in the world (Google it for more info). At least the wind was good for going there – and then it changed and we ended up with NE winds (should have been E to S quadrant and it started that way). I thought this would mean an exposed anchorage so we kept going and ended up hard on the, not very strong, wind. We ended up with our shortest 24 hour run ever – 104 miles and this included a few hours motoring. The fun had just begun though. Once we got close to the strait between Alor and the neighbouring island the currents started. We did as slow as 1.9 knots in spite of motorsailing because of the strong and swirling currents. At times we were doing 7 knots as we hit patches of counter currents. To top it off, when we were about 10 miles from the anchorage the engine alarm came on. Turned out we had had a complete failure of the impeller that circulates cooling water to the engine. To those not familiar with these little beasts, it consists of a wheel with eight rubber lobes sticking out that push up against the pump housing. They wear out gradually as the lobes break off. When this happens you notice that you do not has as much coolant flow are normal. This was not the case here though. It turned out that the rubber part of the impeller and pulled away from the metal hub inside so we went from lots of cooling to none at all. On some engines you can replace the impeller fairly easily, but not on the mighty Westerbeke 58. The impeller housing is turned in such a way that it is not very accessible (you have to take the drive belt off and turn the whole pump). Also the engine was very hot. It was not a great time as we had about 4 knots of apparent wind behind us and a few knots of good current but the tide was scheduled to change against us. Also, the water was very deep, right up to shore so we could not anchor. Fortunately another rally boat was coming up and they towed us into the anchorage where we were able to replace the impeller after the engine cooled. Alor is quite lovely and we like it much better than Kupang. It is not so busy and much cleaner. They teach English in the schools and lots of the young people want to talk to you. Again the people are incredibly friendly and helpful whether you are trying to figure out where a mini-bus (‘bemo’) is going or how much the bananas are in the market. This is a 'bemo', the staple public transport of the region. They are very low inside and barely adequate for most Indonesians - who are not large people. We shared the cost of a bemo rental for a day with a Dutch couple and had a great time exploring this end of the island. We could have gone on the tour organized for the cruisers, but ours was much more fun and also much cheaper. We visited a ‘traditional village’ well up in the hills – actually very nice up there as it was cool – which is the major tourist attraction. The people in this village look quite different – much darker skin and different facial features. Apparently cannibalism still happened in this area until the 1950s, but today the ‘warriors’ have cell phones and may live in the city and drive up to work on their motorbikes. We bought some handicrafts there that were quite nice. 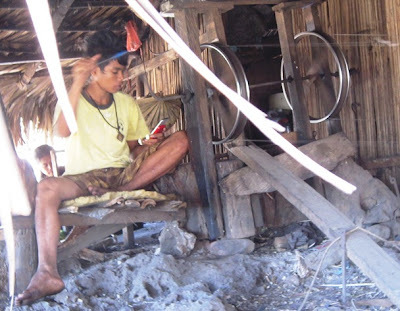 We went to a 'traditional village' in Alor where the locals danced and sold handicrafts. This is one of the dancers. He only looks like he is 150 years old. He is 50. We bought a bow and two arrows. Not sure how many people live in the village now. It is up in the hills and not as hot as near the ocean. The local rally organizers have done a terrific job here. We had our dinner with the regent – a regency is bigger than a district, but smaller than a province with terrific entertainers. They arranged a good price for diesel delivered to the dock and had built a dinghy dock as well. There always were people at the dock to take your lines and answer questions. They even had a couple of buses organized to take us to the Regent’s dinner even though it was only about 400 m away. Overall a great job. Indonesia is the most populous Islamic country in the world but there are sections that are majority Christian, like the parts we have visited so far. Even so, there is still a significant Moslem population. This, of course, means prayer chants from the mosque (there is one in the background as I type this). We had experienced these in Egypt and Jordan a number of years ago and quite like them – they tend to be quite soothing. There was one mosque, or at least one with chants, in Kupang and that chants there were particularly pleasant. This is a good thing since the first one is at 4 am and it does not completely wake you up but you are aware of them. It has been fun getting used to Indonesian money. The exchange rate locally is something like US$1 = 7000 rupiah so when you cash in a few hundred dollars you are suddenly a millionaire and you have bills in your wallet up to 100,000 rupiah. Apparently there has been a large amount of inflation at some point since 1 rupiah is divided into 100 sens. The smallest denomination we have seen is 500 rupiah which was enough for a deep-fried banana on the street (around 6 cents). BTW, the bananas were so good we went back for seconds. Have to mention this – we have had our three fancy dinners and at each the Elvis song that starts, “Wise men say …” was performed, twice with a reggae beat. We are wondering if this is like a second national anthem or something. At one of the performances there was a blues singer who could have walked directly onto a stage in Vegas. She was fabulous. The joys of globalization. Posted by Bruce at 9:15 a.m.
August 11, 2012 at 3:07 p.m.
Hello my name is Kevin, 24, belgian traveller. I'm trying to get to Indonesia by sea, as I'm doing a flight-free trip. I care about our planet and as flying creates a lot of pollution, I decided to adapt my trip to make our world better! As you participated to the "sail indonesia" race I thought you might have advices for me about how to join a crew or to get to know who's planning to sail there. I would like to find a boat ride to Indonesia or Malaysia from Darwin (or Cairns, wherever) by the end of october. I'm ready to work for free, volunteer, do anything before, during or after the trip, I'm quite flexible. Thanks in advance for any information you can give me, and for the time taken to read my message! This trip means a lot to me. October 6, 2013 at 2:53 a.m.